Daniel Andrews’ Labor Party is set to be returned to government in Victoria for a second term, in a crushing defeat for Matthew Guy’s Liberal-National coalition. In a victory comparable to past Labor landslides won by Steve Bracks in 2002 and John Cain in 1982, Labor scored massive swings of up to 10 per cent in eastern suburbs seats traditionally held safely by the Liberals and not considered to be in play. The stunning result set the Andrews government up for a sharply increased majority of as many as 58 seats in the 88 seat chamber with just under half the votes counted. Labor entered the election with a bare one seat majority. The overall swing to Labor was about 6 per cent with around 50 per cent of the votes counted, giving Labor a thumping 58:42 win in the popular vote. Mr Guy called Mr Andrew to concede before 9pm. His leadership is in doubt and recriminations began on Saturday night with former Liberal Premier Jeff Kennett calling for state party president Michael Kroger to stand down. 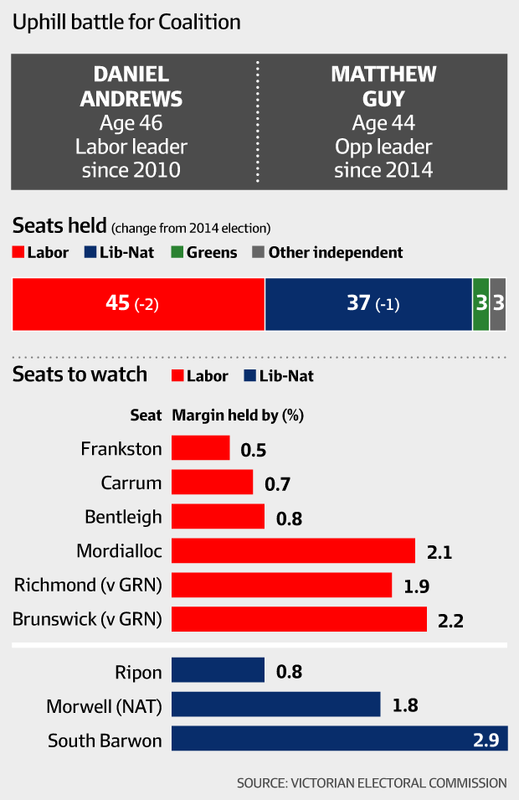 The coalition could have as few as 20 seats, putting its status as an effective opposition and its prospects at the next state election in 2022 in doubt. Victorian Liberal Senator Jane Hume slammed Mr Kroger’s decision to sue major donor the Cormack Foundation just before what became a disastrous campaign that focused heavily on law and order, youth gang crime and terror to the exclusion of bread and butter issues championed by Mr Andrews such as transport, health, education and energy. Mr Andrews claimed victory at the Labor celebration at the Village Green Hotel in his outer eastern suburb electorate of Mulgrave at about 9.35pm, accompanied by his wife Cath and three children. “The people of Victoria have today overwhelmingly endorsed a positive and optimistic plan for our state,” he said. 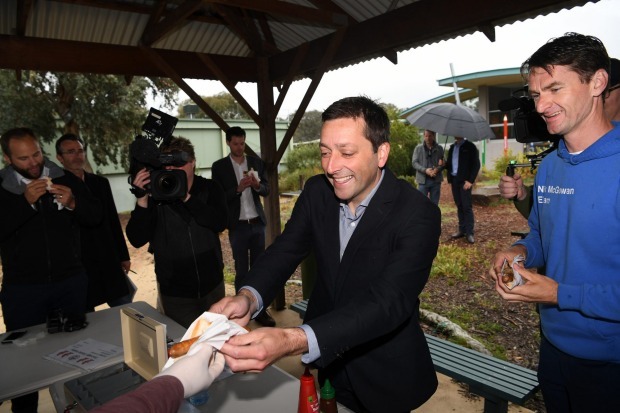 Victorian election 2018: Opposition Leader Matthew Guy (2nd right) snags a democracy sausage at a polling booth in Melbourne during Saturday’s election. Federal seats in Victoria in peril if next year’s federal election in any way follows the trend of the Victorian election include Corangamite, Chisholm, Deakin, La Trobe and Dunkley. Mr Guy told supporters he had congratulated Mr Andrews “on what has been a stunning night for his party” although he expected some of the Liberal seats that were being given to Labor to return to the fold after the counting of pre-polls and postal votes. He defended the campaign as he thanks his wife Renae and campaign staff. “We campaigned on issues we believe are most important to Victoria – keeping Victorians safe, lowering the cost of living and easing congestion especially in the eastern suburbs,” Mr Guy said. Voters resoundingly rejected the Liberals pitch, challenging the coalition in Victoria, and the Morrison government in Canberra which must face the people in a general election by May 18, to resolve differences over policy and culture and broaden their platform from crime and terror to the everyday needs of Australians hard pressed by slow wage growth, congested roads and packed trains. “Something has gone horribly wrong,” said John Pesutto, the bitterly disappointed shadow attorney-general, Liberal member for Hawthorn, and a leadership candidate in the event that he does hold his seat and Mr Guy stands aside after the stunning defeat. 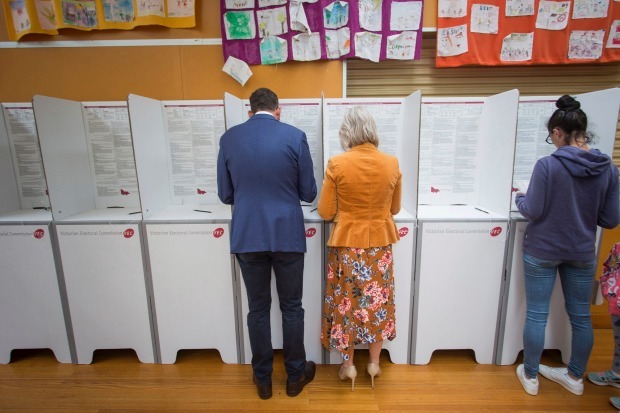 Victorian election 2018: Premier Daniel Andrews and his wife Catherine cast their votes at Albany Rise Primary School, Mulgrave, during the 2018 State Election. The coalition needed a root and branch review of its policies and “what kind of party … we want to be”, Mr Pesutto said. Federal Treasurer Josh Frydenberg, member for the inner eastern suburbs seat of Kooyong, played down the federal implications. He conceded that the noise from the federal leadership change hadn’t helped but he said it hadn’t determined the outcome and cautioned federal Labor leader Bill Shorten against reading too much into it. Other assessments were damning. “There’s an earthquake moving through the eastern suburbs and it’s centred on Mitcham,” former Labor Premier John Brumby said. Labor raids stretched deep into the Liberals’ eastern suburbs heartland, looking set to win Forest Hill, Burwood, Mt Waverley, Caulfield, Box Hill, Ringwood and Bayswater with huge swings. They regained Northcote from the Greens, whose vote was hit by sexual misconduct scandals, and appeared to have defended Richmond and Brunswick from the minor party’s inner city insurgency. The southeast growth seat of Bass, held by the Liberals by 4.6 per cent, also appeared to have fallen to Labor, and the wealthy bayside seat Sandringham and the blue ribbon Liberal seats of Brighton and Hawthorn were also at risk. The resounding result comes after a four-week campaign in which Mr Andrews campaigned on his government’s $80 billion pipeline of transport projects, schools and hospitals aimed at the needs of Victoria’s booming population, and Mr Guy sought to exploit community fear over terror incidents such as the deadly Bourke Street attack on November and violence by Sudanese youth gangs with a tough-on-crime law and order package. Polls taken in the last week of the campaign heavily backed Labor and Mr Andrews – The Australian Financial Review’s uComms/ReachTEL poll by 54:46 on the voting intention and preferred Premier questions. The polling also suggested the coalition’s heavy focus on terror and crime issues had shifted few votes their way, and at least as many in Labor’s direction, with Labor’s position firming from polls taken before the start of the campaign. Liberal Senator Jane Hume from Victoria conceded the leadership changed had damaged the state party’s prospects in the election. “I think there’s absolutely no doubt the incidents in Canberra will inevitably have had an effect on the state results tonight,” Senator Hume said.